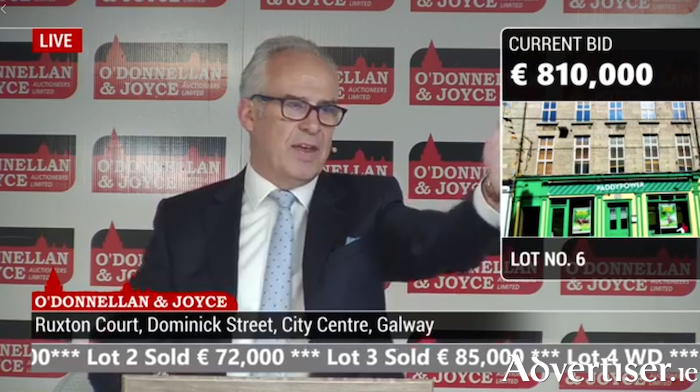 O’Donnellan & Joyce Auctioneers will hold one of the largest live property auctions with some 80 properties going under the auction hammer in Harbour Hotel. Colm O’Donnellan of O’Donnellan & Joyce says there is something for everyone. The Wild Atlantic Way auction will take place tomorrow, September 28, at 11am in Harbour Hotel, New Dock Road, Galway. Registration will begin from 10am in Harbour Hotel lobby, with a tea and coffee reception. No 19 Devon Park has been presented to impeccable standards by the current owner. The property offers beautiful decor, with light filled rooms with high ceilings traditional of a property of its era. This is a wonderful three-bed terraced house located in a mature cul de sac. It has been recently refurbished and modernised to the highest standard and is a must see. Devon Park is serviced by transport links and an abundance of local amenities, while it is only a short stroll to Salthill village, Galway city's West End and Latin Quarter, offering some of the region’s most popular restaurants within close proximity while still being situated in a quiet residential location. Located in the much sought after and well established residential area of Oaklands, No 46 is what one can only describe as a superb family home with an equally superb large south/west facing rear garden. Comprising four bedrooms, it offers generous living accommodation on the ground floor and extension if required. 46 Oaklands would be an ideal purchase for anybody looking to create the perfect family home in the perfect residential setting. Rosedale is a superb residential property in one of Galway's premier addresses. Situated in the stunning and exclusive estate just off of Taylor's Hill, the property offers an abundance of living space throughout and is presented in excellent condition. Externally, 1 Rosedale avails of ample off-street parking to the front, while the gardens enjoy privacy and are superbly manicured with an array of mature trees and shrubbery. This wonderful five bed semi-detached residence is ideally located in the popular and sought after residential area of Whitestrand Park, Salthill, Galway. No 46 Whitestrand Park is a large semi-detached house in the popular residential location conveniently situated on the edge of Galway city and Salthill suburb. The property, which is currently a residential investment, would provide an exceptional rental income for future investors. With modernisation and refurbishment, the property offers an excellent opportunity to be altered into the ideal family, and would be a gilt-edged residential investment. Superb three bed semi-detached family residence with a spacious attic room located in the much sought after area of Devon Park, Salthill, Galway. No 6a Devon Park is a delightful three bedroom semi-detached home in one of Galway's finest residential locations. Situated in a quiet and traffic-free cul-de-sac, just off Salthill Road Lower, 6a Devon Park is presented in excellent condition throughout with a tasteful and contemporary design having been refurbished by the current owner. This is a magnificent opportunity to acquire a spacious semi-detached home in one of the most popular residential areas of Galway. Originally a four bedroom house, 20 Grattan Park offers an abundance of space throughout both floors, while it also benefits from an attic conversion ideal for comfortable storage. Externally, the property avails of ample off-street parking to the front in a family-friendly cul-de-sac, while the rear of the property enjoys favourable southerly aspects. Grattan Park is a well-established residential estate located in the Salthill area of Galway. Long been considered one of the most sought after areas to live in the city, Salthill continues to grow in popularity with a variety of amenities and landmarks on offer. Grattan Park is advantageously located directly across from Salthill promenade and beaches, whilst within walking distance of Salthill village, diving tower and golf club. Exceptional four bed detached home in one of Galway's most popular residential locations, Beach Court is advantageously located directly across from Salthill promenade and beaches, while within walking distance of Salthill village, diving tower and golf club. With the addition of all that Salthill has to offer, including popular restaurants and bars, Beach Court also has the distinct benefit of being within close proximity of Galway city as well, with the vibrant Latin Quarter and Westend a walk away. In a well-manicured cul-de-sac, 17 Beach Court offers approximately 140.74sqm of generous living space over two stories. This four/five bedroom detached family home located in one of Galway’s most sought after areas would also be an ideal gilt-edged investment as it is location within a stone's throw to NUIG and UCHG. No 16 Tudor Lawn is first class with all amenities nearby including Dangan Sports Ground, Bushypark National School, Westwood House Hotel, IDA Business Park, and only a short stroll from NUIG and UCHG. No 18 Grangemore is a modern four-bed detached property in a traffic-free cul de sac just off Rahoon Road. A splendid family home, this property would also make a wonderful investment property as it is located a short distance from NUIG and is on all major transport links to Galway city centre. Breathtaking three bedroom bungalow in excellent condition, Barr Na gCurrach is a small development of bungalows located on the sea-side in the heart of Furbo village. The development enjoys fabulous views of Galway Bay and the Clare Hills and is close to all amenities in the village. Furbo Beach is a short walk away as are the shops, the church, bar and restaurants. Five bedroom detached family home in the heart of Galway . The property is excellently located within a stone’s throw of NUIG & UCHG and is considered one of the most sought after and convenient addresses to Galway city. It is ideally positioned on excellent road, bus and transport networks systems bringing all of Galways amenities and services to its doorsteps within moments. No 7 comprises a four-bedroom semi-detached residence with a spacious rear garden. An ideal family home in a much sought after area of Knocknacarra, this property is located adjacent to all amenities and has a regular bus service to the city centre right on its doorstep and is within walking distance of McGrath's field, Knocknacarra church, Joyce’s supermarket and Salthill village. The finest semi-detached three-bed family home located in a new development built by Burkeway Construction, this property is the original show house and is presented in mint condition throughout. Maoilin is considered one of the finest development of semi-detached homes in recent times. Perched overlooking Galway Bay and with stunning views of the Atlantic Ocean, Ballymoneen Road is close to Barna, it is only minutes from the nearby retail centre with facilities such as a supermarket, pharmacy, cafés, and restaurants. Outstanding family home in this leafy sylvan setting, this stunning four bed semi-detached period style property located on the edge of Tuam town centre. This is the finest home to come to the market in this area and is in exceptional condition throughout. Modernised, but maintains the old world character and charm, this property oozes style and class. A wonderful three bedroomed terraced property located in the heart of Galway city centre is in an exceptional location being close to both city centre and the Docks. The property is currently tenanted, but will be sold with vacant possession. This wonderful one bedroom apartment located in the heart of Galway city is in a highly desirable location on the west side of Galway city and ideally located on Dominick Street, Galway. The property is just a stone's throw from the vibrant cobbled streets of the city centre with its many shops, bars and restaurants. Some of Galway city's famous landmarks such as The Spanish Arch, The Long Walk and Galway Cathedral are within walking distance. This three bedroom detached bungalow located in rural tranquillity on the edge of Galway city is in need of some modernisation and would make a wonderful starter home or investment property. Located just a short distance from Galway city and all local amenities. This magnificent four bedroom detached family home comes with a one bed extension (flat ). The property is located near Craughwell National School, just off the old Dublin Road and only one kilometre from Craughwell village and close to all amenities including transport links. This is a unique opportunity to acquire a private pier to moor a yacht, extending to 0.11 hectare (0.27 acre ) approximately and located on the edge of Galway city. Very easily accessed as it is just 250m off the Coast Road to Oranmore (R338 ), Galway City is less than seven kilometres away and Oranmore train station is less than five minutes drive, Perfectly located six minutes from the Galway to Dublin motorway (M6 ). For boating enthusiasts, this is "living the dream". This boat house is within walking distance of the city centre, and stands on a substantial site with frontage onto the River Corrib. Located only 500m from Galway city centre with access via pedestrian tree-lined walk on the shores of the River Corrib, it is a concrete block built structure, wired for electricity. Two bedroom third floor duplex apartment located within walking distance of Eyre Square is a modern and attractive development which has been well maintained throughout. The accommodation comprises living room, kitchen/dining area, two bedrooms with en suite off master bedroom, and main bathroom. The complex contains underground car parking and lift access. The property is currently rented and is generating €1,050 per month and is being sold with tenants in place. This is an excellent investment property. Centrally located two-bedroom duplex townhouse with the accommodation spread over three floors. This is an excellent location being within walking distance of city centre. The property is currently rented and is generating €1,100 per month and is being sold with tenants in place. Three bedroom mid-terraced residence conveniently located to Galway city centre. Accommodation comprises entrance hall, downstairs toilet, kitchen/dining room, living room, three bedrooms (one en suite ), and bathroom. The property is being sold with tenant in place and is currently generating a rental income of €860 per month. Presented in good condition, this property would provide the ideal investment. This three bedroom mid-terraced residence conveniently located to Galway city centre comprises entrance hall, downstairs toilet, kitchen/dining room, living room, three bedrooms (one en suite ), bathroom. The property is being sold with tenant in place and is currently generating a rental income of €900 per month. Presented in good condition, this property would provide the ideal investment. Gleann Noinin development is a 10 minute walk to the city centre and a short stroll to the Wellpark Retail Park, Mervue Business Park and GMIT. It is also located just across the road from Lough Atalia Bay and the Huntsman Bar & Restaurant. Viewing is highly recommended and guaranteed not to disappoint. Circa 19 acres of agricultural lands which were quarried in recent years, the property benefits from approximately 30m of road frontage onto a secondary road. The lands are located approximately 5km off the N83 Tuam/Dunmore Road. Carrowrevagh is a rural townland 10km north of Tuam town and 15km from Dunmore town which has access to all necessary amenities. This is a two bedroom ground floor apartment situated in a modern development in the heart of Oughterard village. This is an attractive development with communal green areas and off street parking. The property would provide an excellent investment property or starter home. Oughterard is known as the Gateway to Connemara and is a well-known tourist location. Modern 1,800sqft warehouse unit comprising four ground floor retail units with 17 first floor offices along with communal. Several of the units are occupied while the remaining units are vacant. The property is currently generating a passing rent of €5,800 per month. This three bedroom bungalow located in Woodville is located a short drive from the village of Kilchreest and approximately 8km from Craughwell Village and 30km east of Galway city. The property requires upgrading throughout and it appears that the rear shed and septic tank are outside the boundaries of the subject folio GY53997F. Traditional style two bedroom cottage set in a scenic location overlooking Ballinakillbay and Diamond Hill. The property features an open plan kitchen/living/diner, bathroom, two bedrooms. The property is located close to Letterfrack village, Connemara National Park, Kylemore Abbey, Clifden and Cleggan. Currently rented, the tenants are due to vacate on October 30. Folio number GY87262F. This modern three-bedroom duplex apartment located on the second and third floors is located off the main Galway/Headford Road and within easy reach of Galway city centre and on a regular bus route to and from the city centre. The property is being sold with vacant possession. Contains spacious living accommodation and the overall development has been well maintained throughout. This would provide an ideal starter home or investment property. This five bedroomed detached residence with garden to the rear and parking to the front is situated within walking distance of the town centre and all local amenities. The property is located within easy commuting distance of Galway, Ennis, Shannon and Limerick via the M18 Motorway. This three bedroom first floor townhouse, located close to GMIT and within easy commuting distance of Galway city centre is being sold with tenants in place. Visit www.odonnjoyce.com to watch the live stream of the auction. Also to view the full list of properties on offer log on to the website which includes properties in areas such as Galway city and county, Mayo, Roscommon, Sligo, Donegal, Leitrim and Limerick. The next auction is launching October 11. O’Donnellan & Joyce Auctioneers, 5 Mary Street, Galway 091 564 212. Page generated in 0.1350 seconds.